If you want to buy or lease a new Toyota in Burleson, TX, come to Family Toyota of Burleson. View our inventory of new Toyota vehicles, including new cars, like the 2019 Toyota Camry Hybrid, trucks, as well as SUVs like the 2019 Toyota Highlander or 2019 Toyota RAV4 Hybrid on our website to find the new car or truck of your choice, or come to our dealership to take a test drive. Contact us today at (817)768-2829! Our website offers an array of online tools to help expedite your search for the perfect new vehicle. In fact, you will find extensive data on each of our vehicles simply by clicking its inventory listing. There's no need to perform research anywhere else! Get information about transmission type, horsepower, towing capacity, and a lot more just by expanding any of our vehicle listings. Use our search module filters to see only trucks or cars that appeal to you. Filter search results by color, body type, fuel economy, and more. 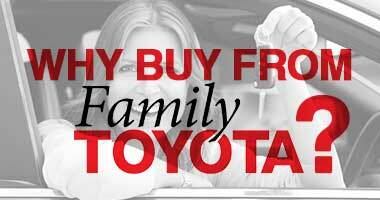 Why Buy at Family Toyota of Burleson? Here at Family Toyota of Burleson we offer something for every shopper, whether you are on a budget and looking for a used car priced under $10,000 or you want a little more peace of mind with an affordable certified used Toyota. If you opt for a Certified Pre Owned Toyota vehicle, you will get the added security of a rigorous certification process (including a multi-point inspection and refurbishing process), a full vehicle history report, an extended factory warranty, and 24-hour roadside assistance. Come by and learn more today! Our highly-trained sales team can answer any questions you have, and we would love to get you out on the road for a test drive. Getting behind the wheel of a vehicle lets you explore its interior comfort, controls, features, and ride. It's the only way to know if you will enjoy driving the car you want. And there is nothing more exciting than driving a new Toyota, so why not schedule a test drive and experience it yourself? If you need auto financing to complete your Toyota purchase, speak to one of our welcoming finance managers. They offer their years of experience and talent to secure an auto loan package that will meet your budget requirements, without draining your bank account. If you are a driver with a few credit problems, our Finance Department staff is here to help! Apply for an auto loan on the Family Toyota of Burleson website now. After reviewing your application, one of our helpful finance managers will contact you to discuss your options. We offer the Family Toyota Public Safety Discount for services such as Toyota Parts & Accessories, repair, certified service, collision and more to cater to our Public Safety First Responders quickly and efficiently. We invite you to come to Family Toyota of Burleson for all your Toyota-related needs in Burleson, TX. You can expect a warm welcome when you visit our dealership! We are happy to serve Burleson, Crowley, and Mansfield with Toyota sales, service, and parts. Visit us today to find your dream Toyota in Burleson, TX!